From the storage drawer to the large shelf to the antique detailing and curved piece in the back, it was perfect, and $140 later it was mine. 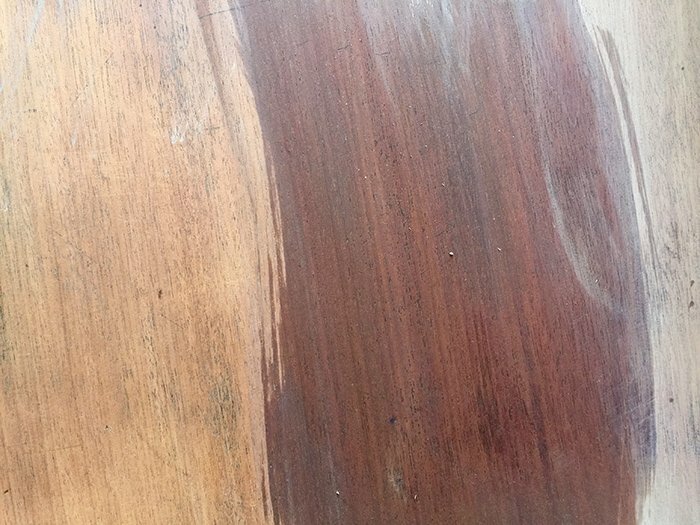 I’ve never really been a fan of red colored furniture so I wasn’t thrilled that this wood appeared to be inherently red once I saw the piece in person. 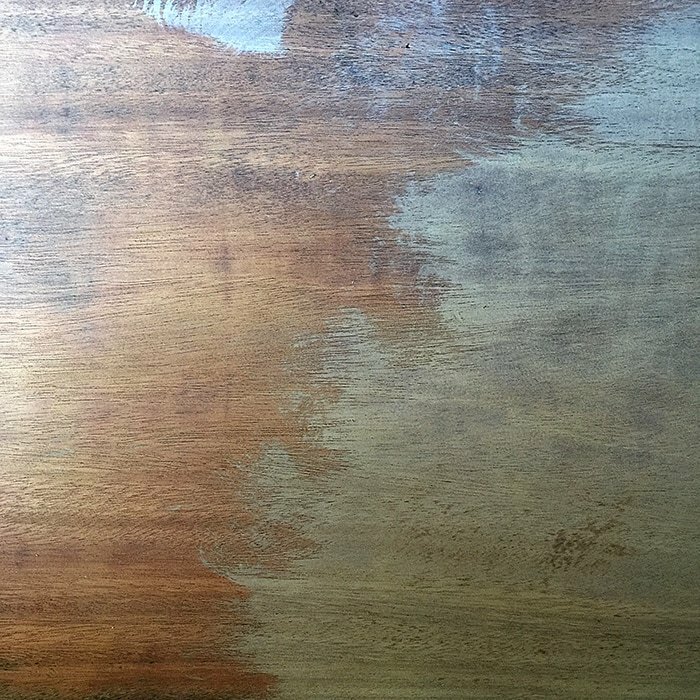 I had dealt with this type of wood before when I refinished our antique master bedroom dresser—the process was a long and frustrating journey that didn’t end exactly as I had planned, but it was a learning experience. I decided to try something new this time. Enter, Maison Blanche paints. I’ve used Maison Blanche chalk paint once before (remember my friend’s aqua dresser makeover?) but this project was different. The goal was to let the wood grain show through, but in more of a natural weathered wood and less of a dated red varnish way. So they graciously sent me a variety of chalk paint, lime paint, glaze, wax and varnish just to make sure I had my bases covered. Before starting on the finish, we had to adjust the height of the vanity. 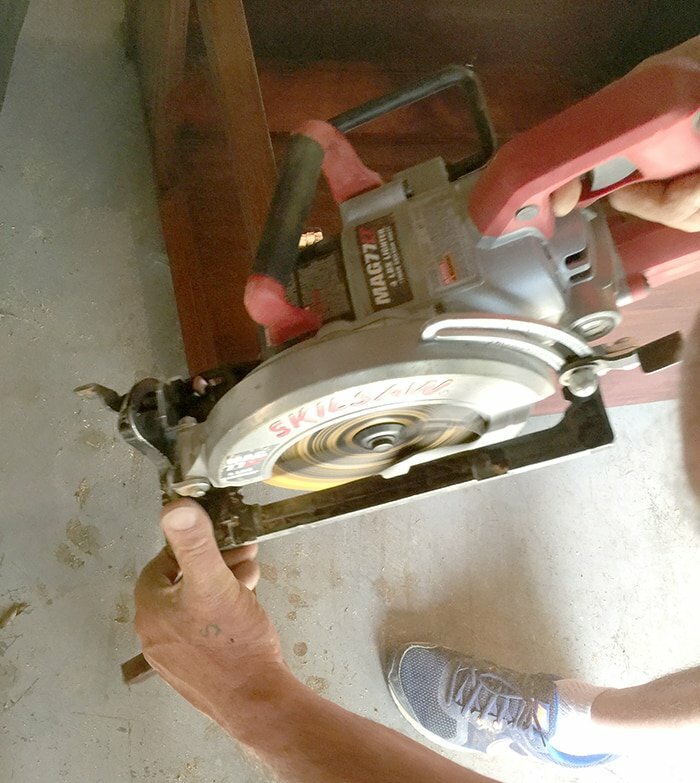 It was a few inches taller than standard height (which is somewhere around the ballpark of 32″), plus I knew I’d be adding additional height with a vessel sink so we chopped the legs down with a skill saw. This definitely helped eliminate some of the reddish hue but it was still a warm orange tone underneath. It was looking much better already but I knew (from experience) that as soon as I added any sort of moisture or sealer it would want to go right back to that reddish hue, so I thought that perhaps adding a soft white/gray wash may neutralize it. You can see the original wood on the left and the lime finish on the right. It didn’t appear painted on, rather, like it had changed the genetic makeup of the wood itself to a naturally aged species. Completely different than any standard latex paint I’d ever used. Here you can see it in process… this was taken right after I had brushed it on before it dried. The lighter finish on the right edge had already dried after being brushed on just a couple minutes prior. Then the process became fun. I mixed and brushed and watched in awe as the wood transformed before my eyes. Since this piece was made up of different kinds of wood, some parts took reacted with the mixture better than others, but the red was completely gone. I could have added more paint to the mix and ended up with a true white washed look, but I really wanted more of a medium toned wood for this room so I left it at one light coat. I wish I could tell you that it left my perfectly weathered wood coloring untouched, but unfortunately it did pull out some of the original warm/red tones. However, it was still a huge improvement over the original finish so I let go of my type-A perfectionism. 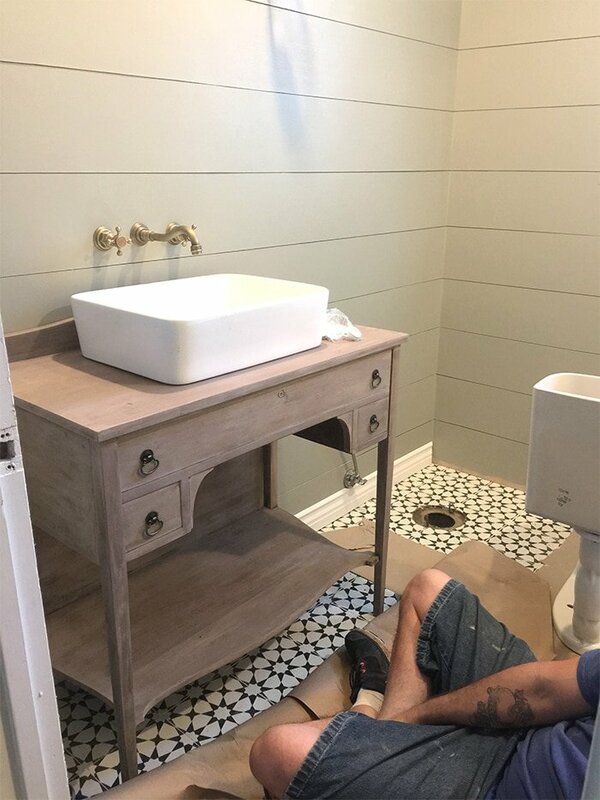 I didn’t want the plumbing to be noticeable, so I had him make it as low profile as possible and I’m so happy he was able to pull it off so well. We used regular black plastic to save money and I painted it using black matte chalk paint. You can’t even tell it’s there unless you kneel down. I purchased the drawer rings for $4/ea from my go-to hardware source: Ebay. The subtle brass finish plays nicely with the other gold metals in the space. (PS—you can find a source list for everything in the room in the original reveal post). That tutorial is coming up next month! 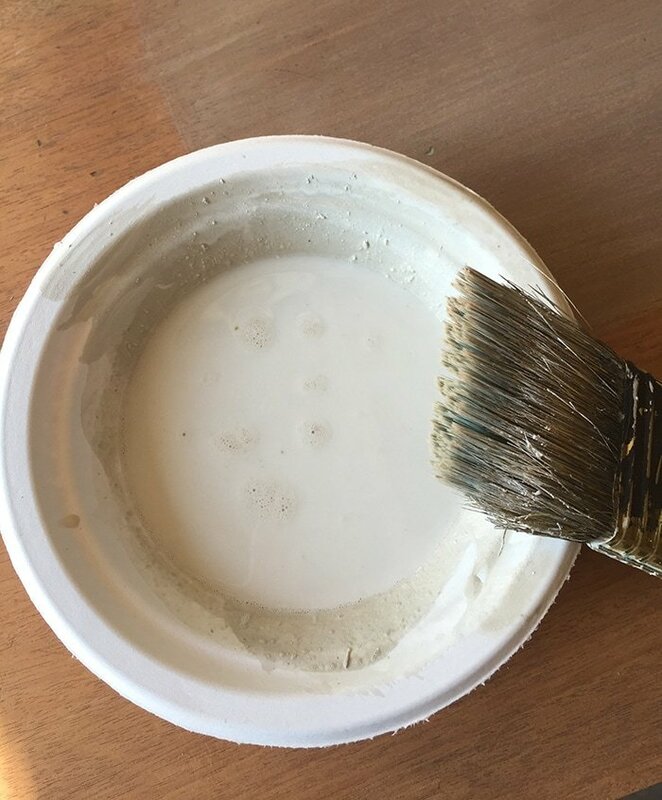 Have you worked with lime paint before, and if so, what were the results? I’ve been looking around the house trying to find another piece to makeover just to work with it again. It’s pretty fascinating how many different ways you can use it! 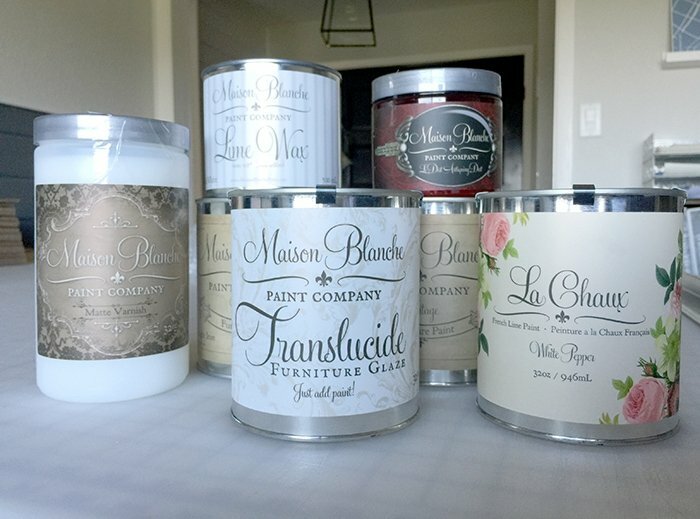 A few of my blogger friends also experimented with some Maison Blanche paint recently—head on over to their blogs to see what they did! And with that, I’m packing my bags right now en route to Seattle for the next 7 days. I have my first in-person client (ahem, cousin) room makeover project we hope to finish while I’m there and I can’t wait to share the details on that soon. The pressure is on! Shop Grand Opening & a Giveaway! 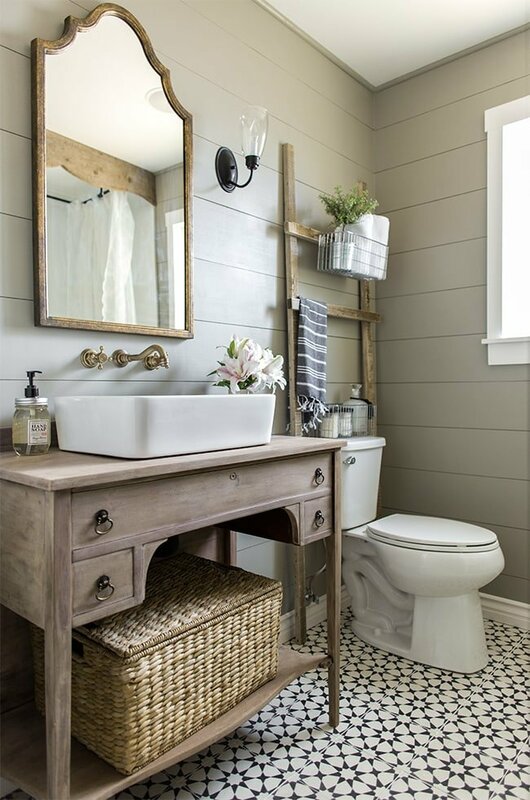 I LOVE how you painted the vanity! So smart! I think I’m going to have to try this on our dresser. There is so much less sanding involved when you strip the piece first. 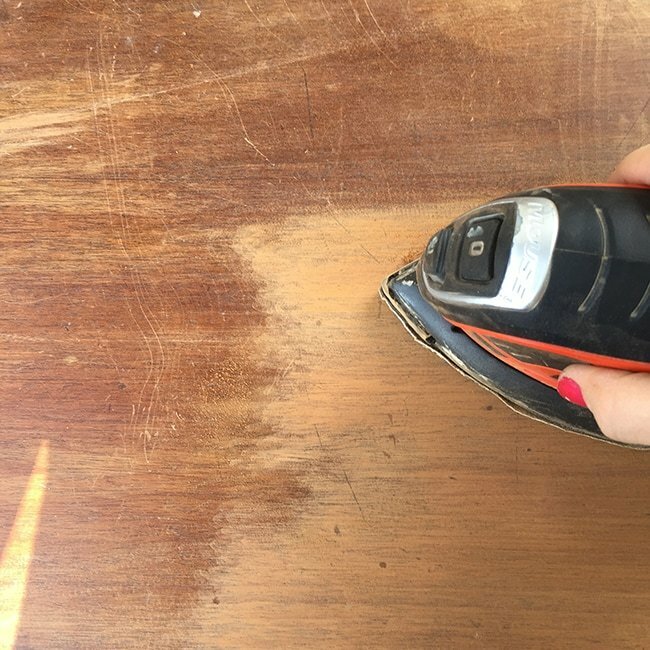 I use Citristrip, it doesn’t smell, it’s family and pet safe, you can do it indoors, and it’s so easy to use. Thanks for the heads up, Crystal! I’ve used strippers in the past and it ended up being a messy unpleasant experience. 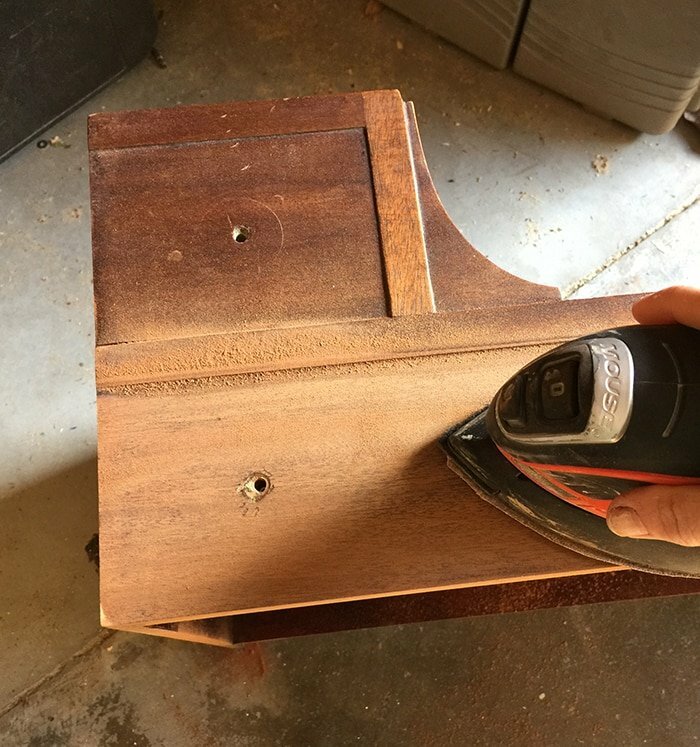 This piece didn’t have much of that hard shellac coating to remove — I was trying to sand out the wood stain more than anything. I’ll definitely look into Citristrip for next time! Truly amazing transformation. Love it! Does Lime paint give the same effect as liming wax? Thanks Julie! I need to experiment a bit more with that. I didn’t use wax on this piece but I used it on our tub. I’ll have to try them both out on bare wood and see what happens! I love how this turned out Jenna! it’s the perfect blend of cool and warm tones in my opinion. 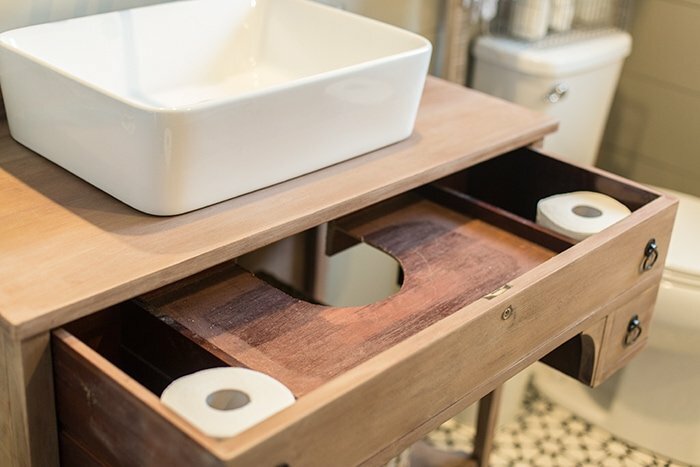 This piece is what got my husband on board with the whole repurposed bathroom vanity trend, so I thank you for that. Great job on bathroom Jenna. While having refinished many many pieces of furniture, staying mainly with stain and finish, I have never used lime or chalk paint. Is the lime paint a chalky finish? And did the varnish give it a hard furniture finish? Sprayed on or brushed? The lime paint is pretty thick and has unique texture… a bit different than the chalk. The varnish was brushed on and disappeared into the wood (it altered the coloring but you can’t tell there’s anything on it). It feels like bare wood even though it is protected. Wow! It’s so fantastic way to do something with old furniture. Where did you get that tile? I’m in love! Thank you! Cement Tile Shop. There’s a direct link in the Reveal post linked in the beginning! Thank you Jenna for the response. That was a big help. I’m having the same issue as Valerie in Feedly. Hope you can resolve this soon! Hi Kristy, Valerie had mentioned it started working after she manually updated her Feedly. I think that may be the only option since the feed is technically working properly so it should be on Feedly’s end! Believe it or not, I’ve never heard of Lime Paint! I think I need to get out of the house more often 😉 I’m so excited how well this turned out that I’m most definitely going to try this on a dresser I have at home! My daughter and I have followed every step exactly on a similar table. We painted only the top. We chose a fairly deep red. We are to the last step, the final finish. My daughter wants to use the wax finish. Is this the finish you would recommend? Several sites say poly is the hardest finish. We have put poly over paint in the past and had an issue with peeling so we are a little apprehensive about trying it again. I wouldn’t use wax if it’s a surface that will get wet a lot! 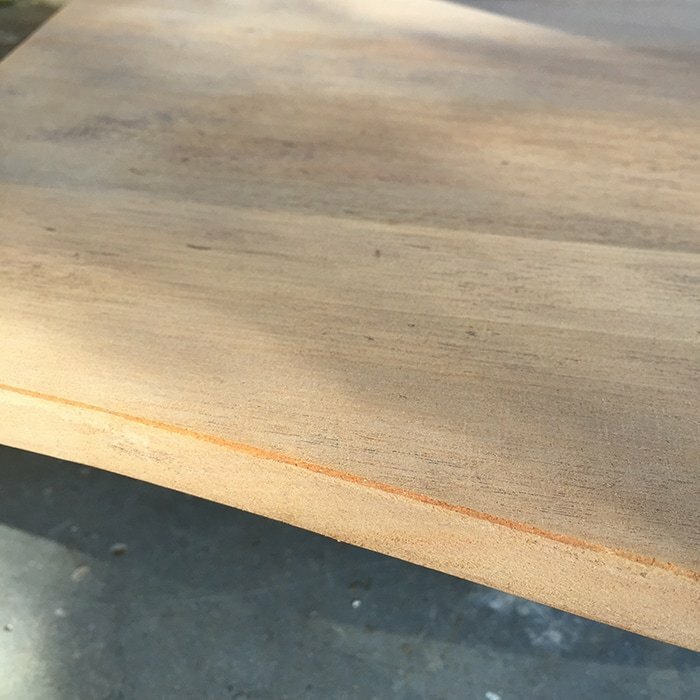 I’ve never had an issue with poly peeling (I use Minwax Polycrylic) but furniture varnish may be a better option for you. Good luck! Wow, so stunning! You did an amazing job. I hate sanding too, ugh. But totally worth it for that piece. I would have done the same thing. I’ve got to try that lime paint. Looks amazing. This is beautiful! Great Job! I also love the mirror! Where did you get it? Thanks! What an incredible job! Thank you so much for sharing your work of art and giving such detailed instructions. 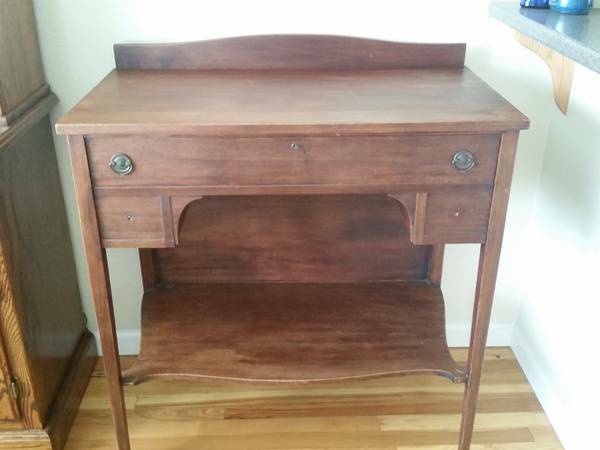 I’m on the hunt for a dresser to re-finish a lot like both this and your dresser in your master suite. Is there a certain type of wood to make sure to hunt for to get that beautiful bare look? 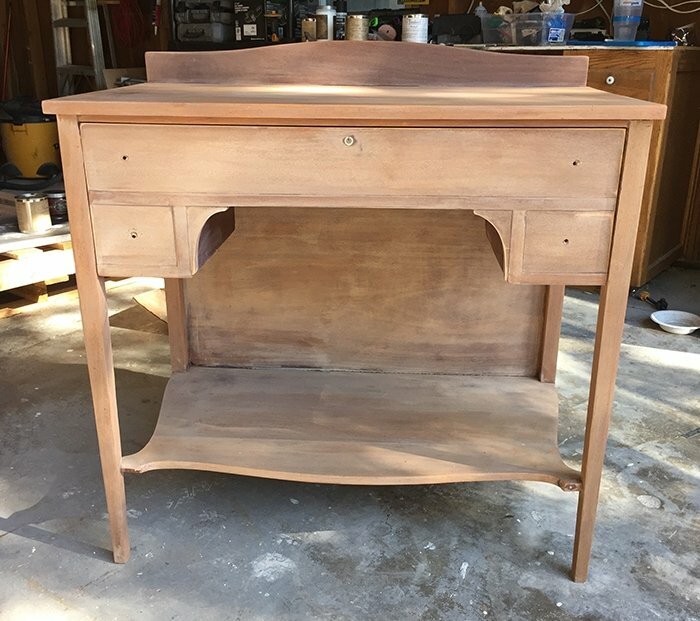 I am eyeing a couple of cherry stained dressers on craigslist but I’d hate to spend hours and then find out it will never sand down to that great rustic tone. 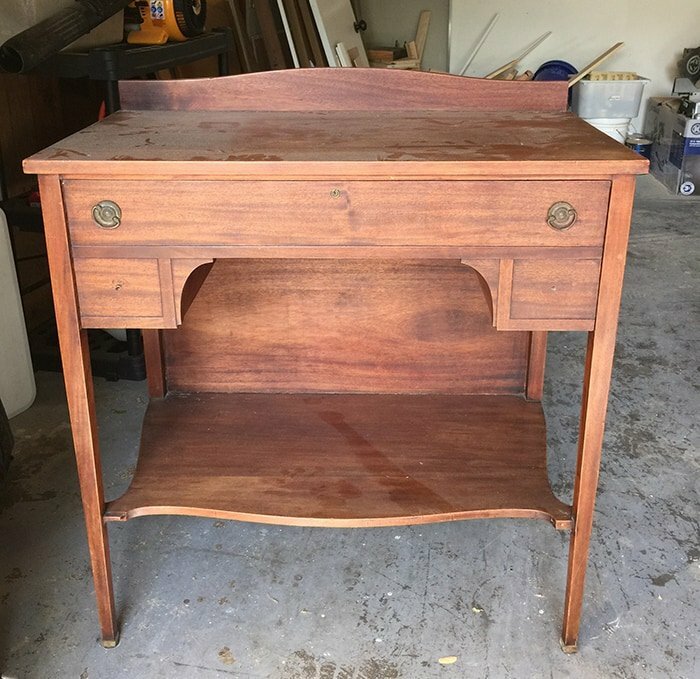 I’ve found a lot of the older pieces are that cherry/red wood which is really difficult if not impossible to get rid of entirely, so I’d look for something that is closer to the color you want already. Lime paint helps a lot too though. Good luck! Hi Jenna – I left a message on your other post regarding the name of your mirror and who makes it. Also, approx dimensions would be helpful. Thanks much. so I love love love the vanity color. I haven’t used lime paint before I like how the color came out a weathered/distressed look. I want to capture the same color and attempt to use it on my pre existing vanity. How much water did you add? Is there something else you would recommend to achieve the same weathered look? There really is no formula, I just winged it! 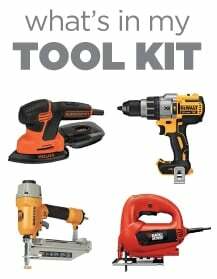 You can test out on a hidden piece of wood and use a little at a time. Try starting with more water and adding a bit of paint at a time until achieving your desired look. Hi there! 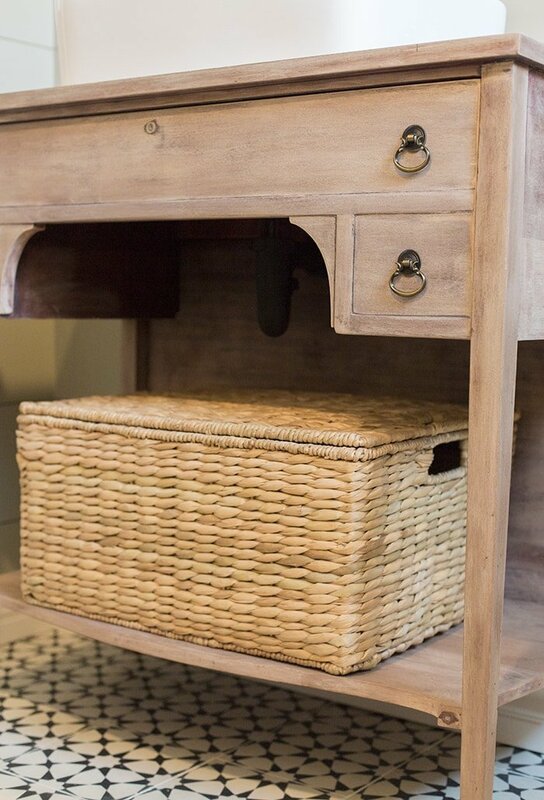 what is the actual height of your table from floor to top of vanity(without the sink). I have an old table made of barnwood I need cut down but want to make sure I cut the right amount. Thanks! Wayfair but it’s no longer in production unfortunately. Beautiful, I love it!! This is our inspiration for our new house build master bathroom What are the dimensions of the vanity? Thank you! It’s 19d 35w 33h”. 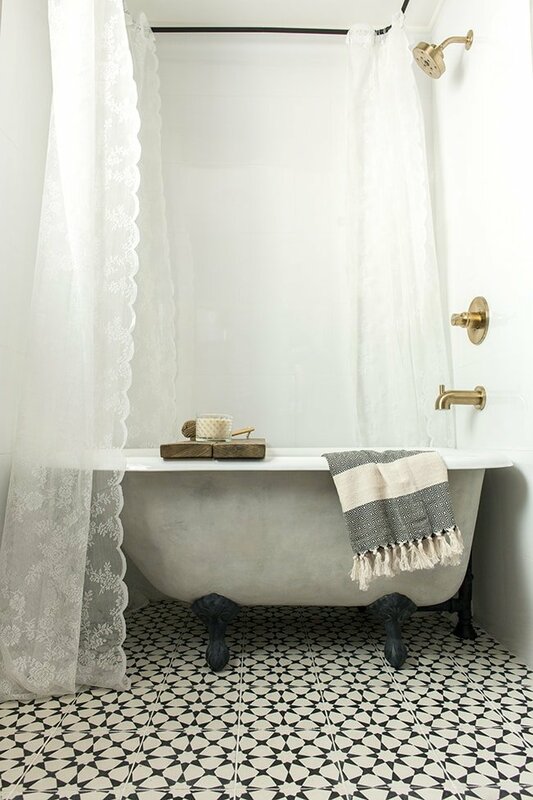 I love this bathroom so much that I am literally stealing a lot of you ideas ! 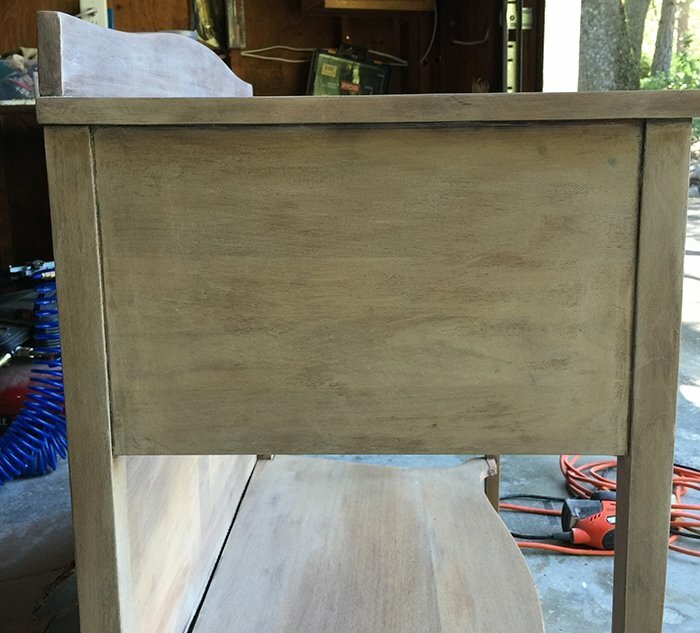 I wanted to know about how much you watered down the lime paint… I am guessing quite a bit because I have tried little amounts and it seems to cover more opaque than I want it to… the dresser I have is also red oak and I’m looking for a finish like yours… Do you think I should go heavy on the water, so that when I brush it on it’s almost clear with a tiny hint of the white pepper? Thanks! Just the lime paint as far as I can remember! 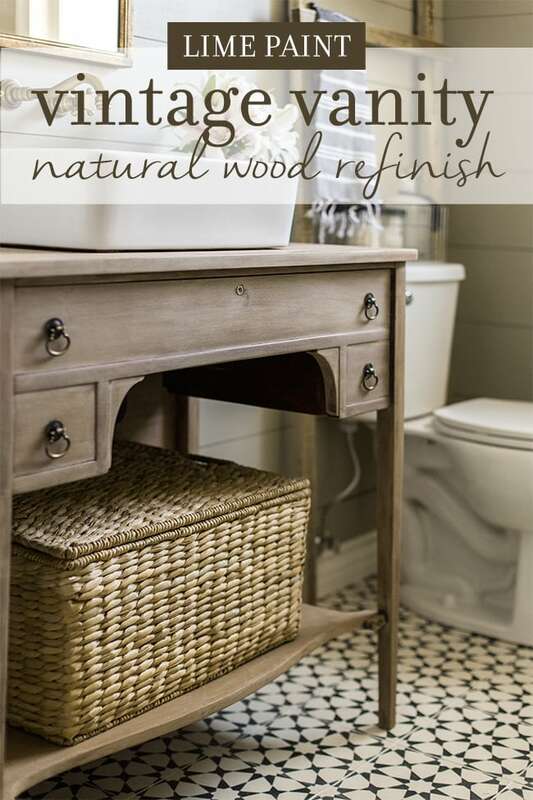 Love your bathroom remodel! I’m redoing my daughter’s bathroom and am going to use yours for inspiration. What wood did you use for the walls? I didn’t see that mentioned in the blog – sorry if I missed it. Thanks! It looks amazing! Can I ask what grout color you used? I’m guessing white, but wanted to make sure! Possibly the brand and name? Thanks!